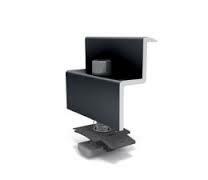 All Black FRAMED solar end clamp 34-36mm. Module fixing bracket 34-36mm panel end clamping system. Part of the K2 black panel range of module fixing components.